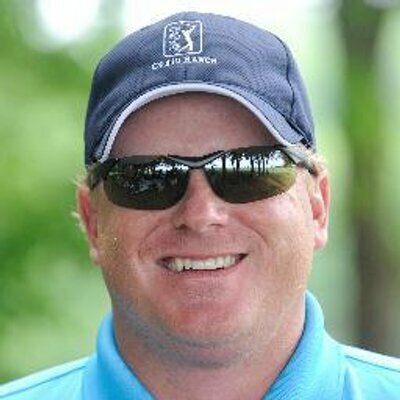 CJ Goecks:	Hey, CJ Goecks here from ShortGameSecrets.com and I'm on a down slope. I've got these balls laid out here. I wanted you to notice the difference in the clubs here. Just so, because it's kind of hard to tell when you're on a camera just the amount of slope here. Let's talk about how to hit this shot, okay? I'm over the green, I've got some area to carry, but that's not my first priority. What you have to understand is when you hit a normal chip shot we had our feet together. Well, and we're leaning forward or towards our forward foot. Well, if I do that here I'm doing to literally fall over. When you're on slopes your priority is you want to make sure that your hips and shoulders match the slope, play the ball towards the higher foot and then swing along the slope. That doesn't matter if it's a chip shot or if you're in the fairway from 180 yards out. In this case I want to make sure my hips and shoulders match the slope first. In order for me to do that and not fall over I've got to take a wider stance. I'm going to really tilt my hips and my shoulders because that's how much this slope is. Okay? Now I've got to play this ball towards the higher foot so I'm going to move it back just a little bit and then I've got to swing along the slope. In this case I'm going to finish low. I want you to feel like you're hitting a knock down shot, so that way I stay in this short. The worst thing I can do here is try to help it up and then thin it and hit it over the green and get into trouble or whatever the case may be. You need to understand what the golf course gives you. Any time you fight the golf course, you're looking for trouble, okay? In this situation I'm going to set up here, get my hips and shoulders, move the ball back and now I've got to work my shoulders up, club up, hinge it quickly. It's a quick hinge and then low finish, that way I stay in it. Go in, all right? The ball is lifted out there. Again, what you're looking for and again, that shot becomes easy because I have to do what the golf course gives me. If I fight it, it becomes difficult, so remember any time you're on slopes, match your hips and shoulders to the slope. Number two, play the ball towards the higher foot and three, swing along the slope. In this case I need quick hinge, low finish and you will hit a lot more shots. You'll be the envy of your friends and you'll be enjoying this game a lot more.